Kingsway Bingo has been around a while now, and while it’s one of the lesser known brands around the net it’s well worth a look in. The brand operates on the Dragonfish bingo software and that means free bingo, big jackpots and some big sign up bonuses too. The homepage isn’t really the most exciting we’ve ever seen, but any doubts melt away once you hit the bingo client, which is graphic-rich and gives a glitch-free experience. Getting started is really easy although you’ll need a unique username if you’re signed up with any other Dragonfish network brands as this is a networked site. That aside, the sign up process is easy as 1,2,3 and you’ll be ready to hit the bingo rooms in no time at all. If you’d rather not make an instant deposit, that’s fine, there’s free bingo on offer for much of the day, for real cash jackpots too! You’re unlikely to get any big wins this way but it is a great chance to try out the games for size and see if you like the software. Chances are the moment you hit the bingo rooms you’ll be familiar with the software as it’s used on a great many sites around the Internet, and this certainly saves the usual time getting accustomed to new software. Once you make a deposit you get full access to all the bingo rooms and there’s plenty on offer with traditional 90-ball, US 75-ball pattern bingo, and 75-ball Swedish style five line bingo too! The standard rooms have plenty of players and pot sizes to get the heart racing, and ticket prices vary across the rooms so there’s plenty to choose from whatever your budget. Under the specials tab you’ll find special jackpot games with guaranteed prizes available for pre-buy so whether you like cheap bingo games or big exciting jackpots, you’re sure to find something to suit your needs here. 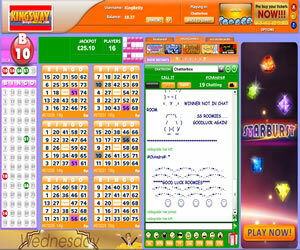 In addition to the bingo there is also a huge selection of instant wins games, slots, casino games and arcade style games. 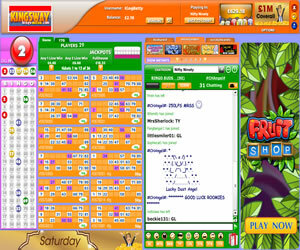 The side games can be accessed from the easy to navigate bingo lobby or the bingo client, above the chat box, while your game is in play. The promotional schedule is jam-packed at Kingsway Bingo, as is the jackpot schedule and there’s plenty to play for every month. However do be aware that the bingo, promotions and jackpots are networked so you are competing against a bigger field of players than with some standalone bingo sites. Overall Kingsway Bingo is a perfectly good place to play bingo, the experience is fun and there’s plenty to keep even the most ardent bingo player busy. The homepage and overall look of the site could really do with a refresh, because it’s actually much better than first impressions suggest. 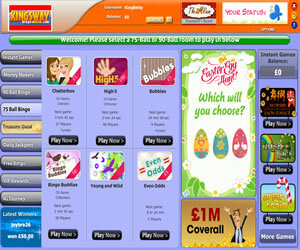 Kingsway Bingo offer three variants of the popular online games. Traditional 90-ball bingo remains a popular choice with players, and there are two variants of 75-ball bingo available, both US pattern bingo, and five line Swedish style. The minimum withdrawal amount is £20 but you must have deposited at least £30 into your account before a withdrawal can be processed. Wagering requirements at Kingsway Bingo are 4x your deposit and bonus, but these aren’t too strict and bonuses can be wavered upon withdrawal.